Made of deep blue black velvet, this low body evening bodice fastened up the back with brass hooks and eyes. It was boned up both sides of the center front, in both pairs of darts, the side seams and one side of the center back, but one of the center front bones and one dart bones is missing. It is piped around the neck opening, armsyes and waist with black silk. The flared sleeves are shaped into four shallow points and lined in black silk taffeta. They are trimmed with two rows of black patterned ribbon edged with delicate open work fringe. Condition: The nap is worn away along folds, creases and some of the boning. A split is starting under the right arm. 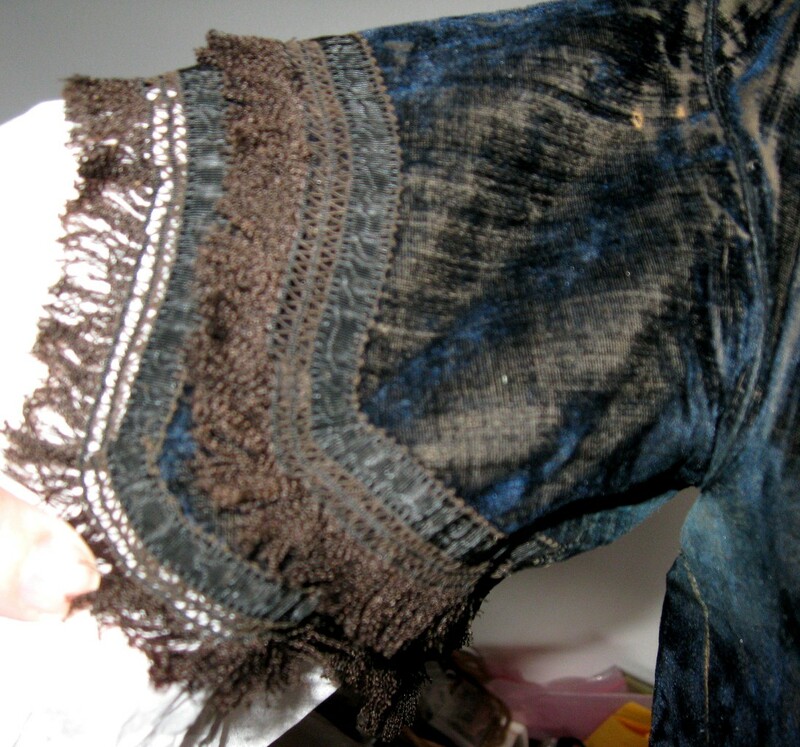 There is sweat bleaching to the brown polished cotton lining under the arms, but it doesn’t show through to the velvet. It's hard to see until the close up photo but it does look to be of a lovely shade of dark blue. Very lovely, wearable sized, ball gown bodice.